Implementasi roadmap tersebut perlu dituangkan dalam waktu yang jelas dan target terukur, untuk mendorong percepatan pembangunan HTI. “Karena pengembangan HTI sangat kompleks serta perlu koordinasi lintas sektor sektor, skema sertifikasi IFCC/PEFC yang fleksibel dan kredibel tepat dikembangkan untuk mendorong percepatan itu,”kata dia. PEFC STAKEHOLDER DIALOGUE 2016: HOW CAN STAKEHOLDERS IN THE FORESTRY ECO-SYSTEM CO-EXIST IN HARMONY? Addressing members of the press at the 2016 PEFC Stakeholder Dialogue in Bali (Nov 17 to 18), from left: Dr Sadanandan Nambiar (formerly from CSIRO); Ben Gunneberg, CEO and secretary general of PEFC International; Dr Terry Sunderland, principal scientist and team leader at CIFOR; Dr Dradjad Wibowo, chairman, IFCC. Have we been too narrow-minded, caring too much about the forest to be paying attention to what is happening outside? How do we have sustainable landscapes where people—governments, NGOs, local communities—who depend on it can engage one another in a way so that all our needs and expectations are met? The 2016 PEFC Stakeholder Dialogue in Bali explores some of these issues in sustainable forestry and its relationship to mankind. “What we are trying to achieve here is to bring people together to think about the challenges of having sustainable livelihoods in sustainable landscapes,” said Ben Gunneberg, CEO and secretary general of PEFC International. Without doubt, one of the ways the panel agreed, was that land management and drivers of change can be achieved via connecting the dots between concept and practice. It means considering all land uses in a matrix where all stakeholders can exist in harmony. In fact, some well-intentioned conservation efforts have not necessarily produced positive outcomes for biodiversity and food and nutrition, Dr Terry Sunderland, principal scientist and team leader at CIFOR, remarked. “We also need to consider the current model of economic growth that we have today. There is under-nourishment and food insecurity in many parts of the world perpetuated by the economic system we rely on,” Dr Sunderland said. 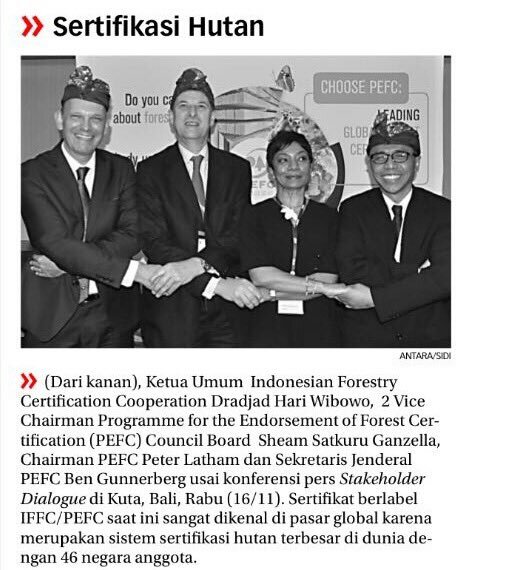 Read more: PEFC STAKEHOLDER DIALOGUE 2016: HOW CAN STAKEHOLDERS IN THE FORESTRY ECO-SYSTEM CO-EXIST IN HARMONY?